Welcome decorating enthusiasts to another edition of the Team Santa Inc. News Daily. We hope your doing well. Today’s topic is bugs, insects, etc. I don’t know about you but if I see a bug in my house I become aware of my surroundings and inspect my property for bugs. It’s called insect patrol. 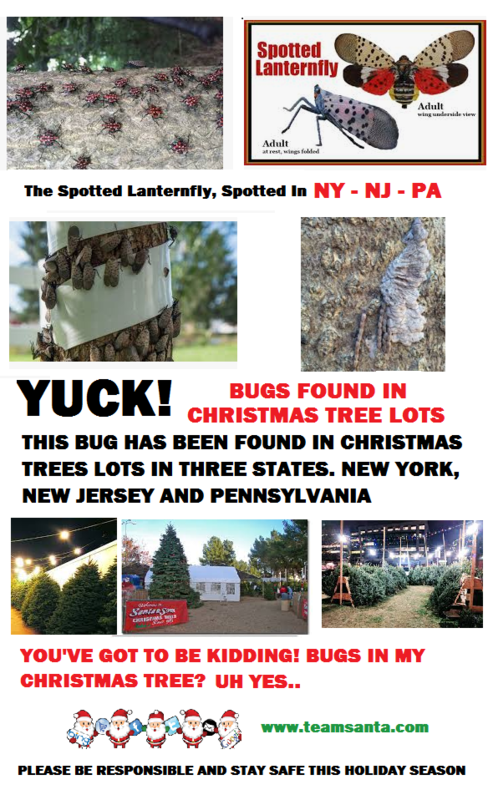 Now all of a sudden this Spotted Lanternfly has just dominated the news related to the possibility of real Christmas trees being infested by ?these insects during the holiday season. There are so many people out there who demand a real Christmas tree but they don’t seriously consider the risk. House fires peak during the holiday season. This is because the Christmas lights can present a danger when used on a real Christmas tree, if used improperly, etc. The owner needs to make certain that the needles of the real Christmas tree do not dry up from the heat of the holiday lights. One thing leads to another and now you have a terrible fire. I see it on the news all the time during the holiday season. It’s sad to say the least, but unfortunately it’s true. So now not only do you need to heed the warning of the fire hazard, but now your real Christmas tree has been exposed to spotted lanternflys. Doesn’t that sound pretty gross? Christmas enthusiasts must now also accept the fact that they may be bringing bugs into their home during the holiday season. This is a serious health and safety concern. Enjoy your Tuesday. We’ll see you tomorrow with more information.